Do you find yourself in need of a great way to promote your new web app or website? Then Placeit has just the thing you need! Checkout this neat Macbook mockup. It features a young woman working on a laptop, while her coworker is texting. The main focus of this scene is the large screen of her Macbook Pro. You can tell she is working hard and you can even kind of make out the smile on her face. She's smiling because the website or software she is using is making her job so much easier. So if you have a website that aids in productivity specializes in creating presentations, provides help with creativity or problem solving, this might be the perfect scenario for you to display it with Placeit mockups as a part of your online marketing strategy. See more MacBook mockups here! 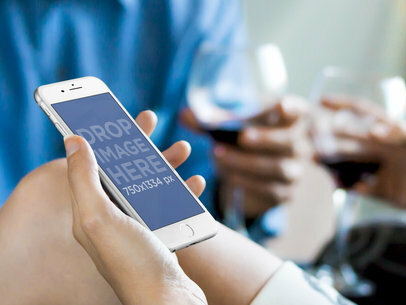 In this White iPhone 6 Mockup you can see a young woman holding her iPhone 6 in portrait position; there is a second woman in the background who is also using a gold iPhone 6, they are both chatting. This stage will help you display your image in a unique manner. A few friends hang out while using a iPhone 6. A friend points out how cool your app is on the screen. This is a great place for a social app or a game. It would also work great for a photography app mockup . The iPhone 6 Gold Mockup shows two girls who decided to go out for lunch, they are chatting while drinking some orange juice; each of them has her own iPhone 6 and they are sitting on a wooden table. This Gold iPhone 6 mockup is a great place to display a portrait image. 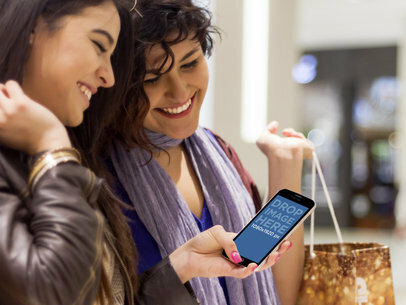 Use this mockup of a woman is hanging out with her friend, holding up an iPhone 6. She is holding the iPhone 6 mockup in portrait view. Sitting to her right is her friend relaxing on a couch. The iPhone 6 mockup holds an image of 750x1334px. This is a great place for a social or casual app. If you're in need of a casual template, in order to market your newest app, then look no further. This scenario showcases a couple enjoying some wine on a date. The young woman is casually flipping through her iPhone. Maybe she's checking out the latest social media app, looking up movies times or checking on their dinner reservations, etc. She could be doing anything, the options are endless. You only need to add a screenshot from your own site onto the screen of her phone and suddenly, the world see's her using your app! 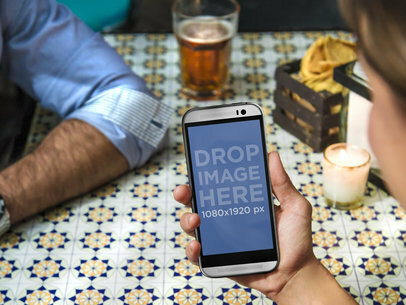 This iPhone 6 mockup template provides a friendly scenario in which we can see two best friends bonding while eating out on a fancy outdoors restaurant. They are using a white iPhone 6 to browse your app, make sure you use this iPhone 6 mockup template to showcase your app's features and design in a clever manner that will create a compelling piece of marketing. 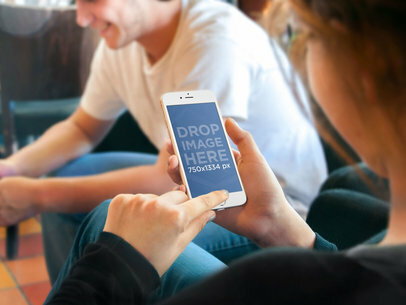 This iPhone 6 mockup template is a great place for you to display your social iOS app right away! Take your android app marketing strategy to the next level. Then you should be using Placeit's mockups. Placeit is a proven effective marketing tool, that you should be using! In this mockup, a woman is enjoying a new video, app or game on her LG G3 phone while being surrounded by people, but it’s what’s on the screen that has her attention. Now imagine that your android app or mobile responsive website, that has her undivided attention? The black LG G3 portrait screen is angled perfectly to allow you to display a screenshot from your app. Turn this social scene into your own personal promotional tool. Authentic, compelling, elegant; we just can’t say enough great things about this stellar stock photo mockup template! Featuring a young couple eating breakfast at a restaurant, the man checks out your new android app on his black Samsung Galaxy S5 smartphone he holds in portrait position as his pretty date waits across the table. He could be using your awesome new android app to transfer funds, book a matinee or order a taxi for them. Whatever it is he means to accomplish, he obviously loves using your new android app to do it on the go. If this scene might work for you then don’t hesitate to use Placeit app marketing software to create a custom mockup of this template. Just upload a screenshot of your android app onto the Galaxy S5 or input the URL so Placeit can do it for you. It’s always fast and convenient so get started now and get Placeit marketing tools working for you. The black HTC One M8 looks great in landscape position! The atmosphere of this template is quite calm, but the table's tile pattern will draw the focus to your product and subtly let your clients know that, despite the tranquil environment in which the product is being used, there is a whole lot happening at the table where all focus is on your product. 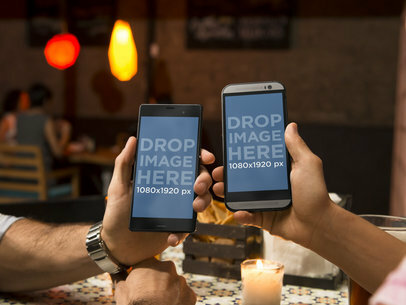 The candle located immediately behind the image onscreen is another sure sign that attention will end up right where you want it; your android app is the beginning of a big opportunity for your clients and this template showcases what you've created. Let's get started! Drag a screenshot of your android app or mobile responsive website onto the HTC One M8's screen to bring your product to life in this scenario. If you have your app's photo in a URL instead, select "Grab Screenshot From URL" above the image and type the URL once prompted! It has been a tough week at the office, but finally, these young professionals learned they were promoted due to their hard work and effort, that kind of news definitely deserves some celebration beers and even gourmet burgers! This is a delightful iPhone 6 mockup in which your new iOS app or mobile responsive website would really stand out from the background. 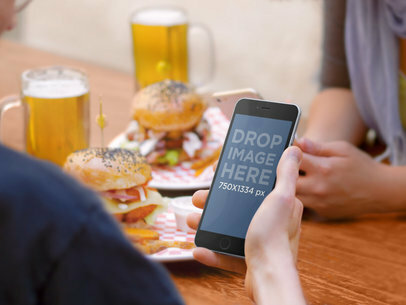 You can choose to showcase your app within this iPhone 6 at Lunch Scene Mockup Generator for a great context that will allow you to display your app’s new design and innovative features to potential users and clients, go ahead and try it out right away. See more iPhone mockups here! This stage shows a caring mother working with her little son on an app for kids. The child is touching the white iPad mini which is laid on top of the child’s table. Across this table, we have a ton of little colorful toys. The mom is holding the child lightly and assisting him while he’s playing with the app. This iPad mini mockup template is perfect for applications focused on kids! Two friends hang out at a terrace. One of them takes her Samsung Galaxy and shows her a new app. It is a relaxed, casual stage for your app or website. The table they are on has teal stripes on it, which would match perfectly if you have a similar palette on your design. 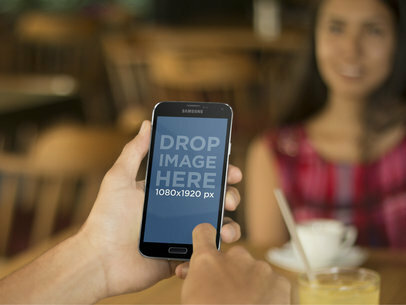 If you need a Samsung Galaxy mockup, choose this one! This real-life scenario mockup could be the perfect way for you to advertise your latest iOS app or website in a relatable way to potential consumers. 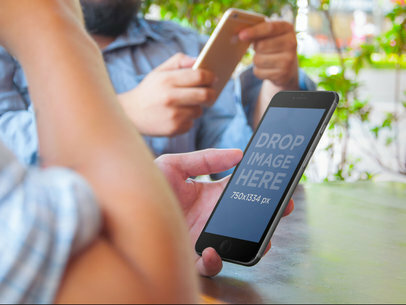 This iPhone mockup features a couple checking something out on a black iPhone 6 being held in portrait position. Imagine if it was your app or website being displayed on this iPhone's screen, wouldn't that be awesome? 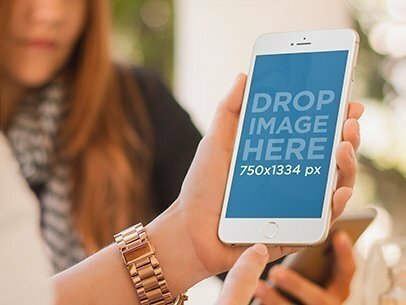 Try this mockup by simply dragging and dropping an image onto the template or by inputting a URL address and let Placeit resize it for you. 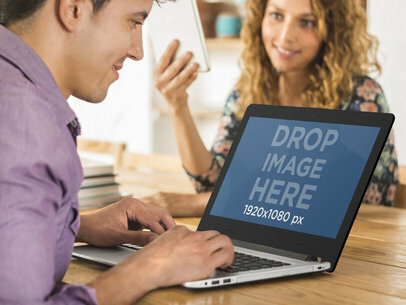 It's time for you to stand out from the competition and there's definitely no better way to do this than by making stock photo mockups from Placeit an essential part of your marketing strategy starting now! See more iPhone Mockups here! This elegant LG G3 android app stock photo template from Placeit marketing tools is truly gorgeous and eye-catching. 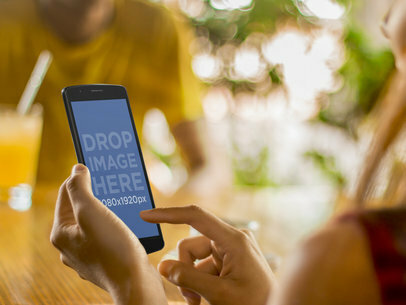 Softly blurred pastel colors and a summer afternoon lunch date is the perfect romantic backdrop to frame your new android app on the black LG G3 smartphone this young lady is using in portrait position. She could be using your new android app to book a weekend getaway or plan a rest of their carefree day. Whatever it is your new app has to offer, use this Placeit LG G3 android app stock photo template to grab your customers’ attention at a glance. See this one come to life with a custom mockup now. Simply drag and drop a screenshot of your new app directly onto the screen in the template, or you can click on the "Grab Screenshot From URL" button above the photo and type in the URL so Placeit can do it for you. Placeit app marketing software is easy to use, and designed to always make you look your best. It’s time to take your marketing strategy to the next level. See more Android mockups here! What a pickup line! 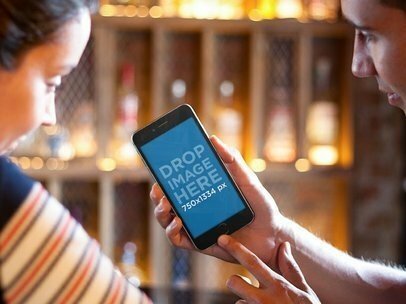 A couple meets at a bar for a drink and this young man has so much confidence because he has your new android app on his black HTC One M8 to share with this lovely woman at the bar. 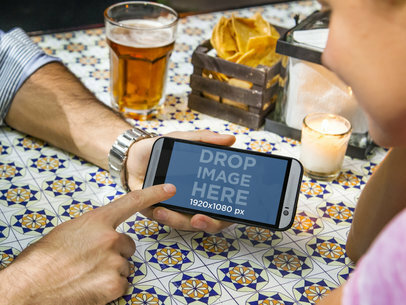 Everything else fades into the background as they focus in on the screen, which displays your app or mobile responsive website in landscape position, your new website is the coolest thing to share on a fun night out. Connect to your target market with Placeit. Be at the hippest spots, on the latest mobile devices. They’re so into you! Try this amazing scenario right away for your social, entertainment or even gaming android app. What a fun scene to showcase your new app! 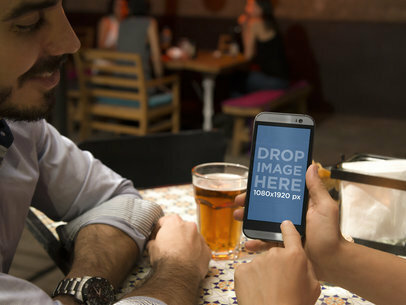 Let’s join this couple for a beer and take a look at your new app on a black and silver HTC One M8 smartphone held in portrait position. This young lady just can't wait to show her date your product. If you need to make a lasting impression on your potential customers in an instant then this is the Placeit template for you. This template showcases that your app is accessible any time, any place and clearly popular with the fun crowd. Everyone can identify with this scene so let this couple show you off to the world. Your product is the star of this HTC One M8 template. All you have to do is drag and drop a screenshot of your app or website directly onto the HTC One M8 screen or type a URL above. Placeit will automatically adjust it for you and create a custom mockup. Don’t miss out on this valuable Placeit marketing tool. Create your HTC One M8 mockup template today and reach your target market. See more Android mockups here! In this sweet and warm mockup we can see a couple that decided to go out to get some delicious coffee at a local coffee shop. They are using an app or browsing a website on their white iPad Mini in landscape position. You can choose to display your social, entertainment or lifestyle app within this beautiful mockup to be able to share an insight on both the design and features; all you need to do is drag a screenshot of your iOS app directly into the bright screen of the iPad Mini, or you can just type the URL above and Placeit will automatically convert it into a screenshot. Try it out now, mockups can have an amazing impact on your app marketing. 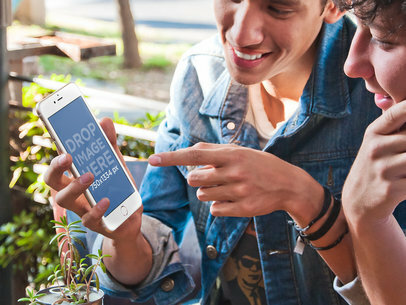 A loving couple smiles as they look at your app or design in this HTC One mockup. 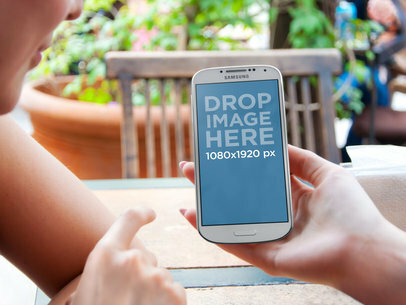 This is a perfect mockup for your casual, portrait mode designs. The colorful sweater the girl wears contrasts beautifully with the white background of the room and furniture, allowing your app or website to be perfectly showcased in this HTC One mockup. 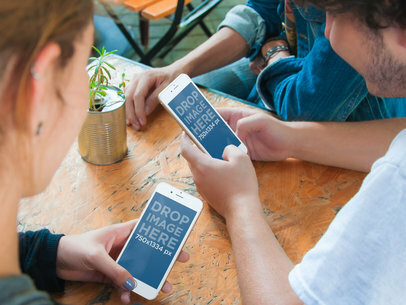 Two friends relax at a wooden table in a garden, one holds up an iPhone 6 mockup for you to show off your app. They talk animatedly over a wooden table. They are dressed casually and are enjoying the sunny day. This is a great place for a social or casual app. The iPhone 6 holds an image of 750x1334px. Without the right marketing and the tools to power it, you will have a hard time achieving the exposure you intend to have. Could it be that it's time for you to upgrade your marketing strategy? Start to use Placeit's stock photo mockups to help you with your visual marketing campaign and stop worrying about everything else. By using Placeit's real-life scenario mockups your potential clients will be able to relate to the situations in which your products are being displayed, making them more desirable and attractive to their eyes. 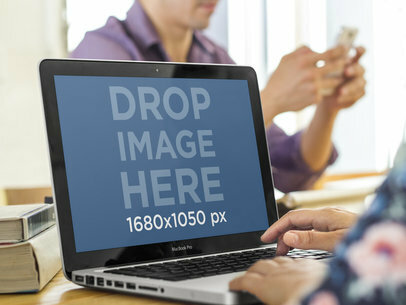 This stock photo features a two friends using a black iPad in a landscape position. Imagine if your app was being displayed on the screen, wouldn't that be great? People would definitely be able to relate to that! To use stock photo templates all you need to do is drag and drop a screenshot of your new iOS app directly onto the iPad's screen in the template, or click on the "Grab Screenshot From URL" button above the photo and type in the URL so Placeit can do the rest of the work for you. Having incredible visual content had never been this easy! Choose this amazing real-life scenario stock photo template to display your newly developed iOS app or website and appeal to potential consumers right away! Photo templates are a fast, easy way for you to showcase your ideas in a relatable way. This stock photo features two ballet dancers looking at a white iPhone 6 screen being held in an angled portrait position. Imagine if it was your app or website being displayed in such a creative template? Wouldn't it be nice? To create a custom mockup, just drag and drop your desired screenshot onto the screen of the device in the template or import a screenshot from a URL by clicking the "Grab Screenshot From URL" button, type in the URL and Placeit will do the rest of the work for you. 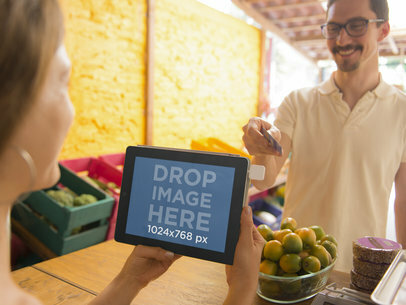 Don't forget that when using photo mockups as part of your visual marketing strategy you are not only saving time, but also cutting down on expenses. What are you waiting for? 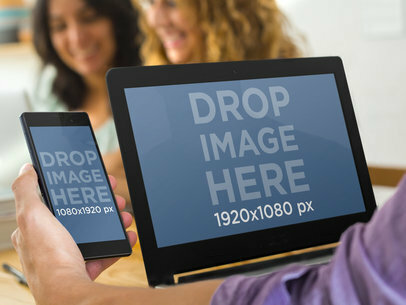 Start using photo mockups today! 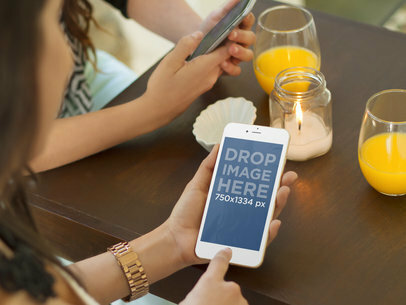 This iPhone 6 mockup template features a young woman who is using her brand new iPhone 6 in landscape position as she waits for her girlfriends to arrive to the mall. This is definitely the perfect scenario in which you will be able to display your new iOS app within context, and being used by a beautiful woman. 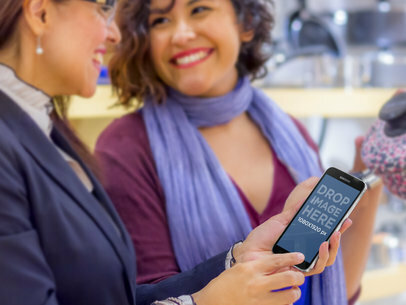 By using stock photo templates as a part of your app marketing strategy, you will enhance the overall perception your potential clients will get from your product; all you need to do is drag and drop a screenshot of your app straight into the iPhone's screen, or simply type your URL above and Placeit will do it for you. 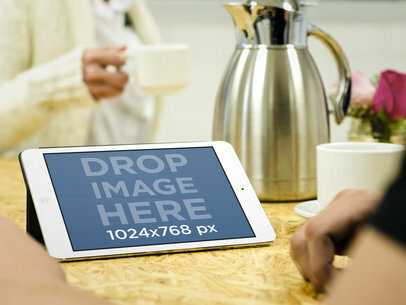 This compelling mockup template is a great tool to enhance your visual content, go ahead and try it out right away! Now the scene in this iOS mock-up is one we can all relate to! 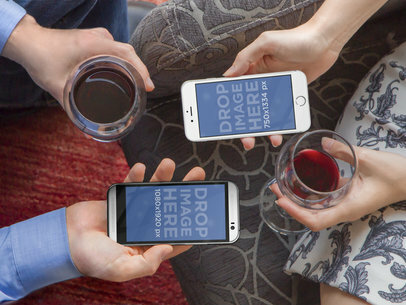 Out at a party or having a casual get together with friends but we just can’t take our eyes off our iPhone. The woman in this template has good reason to be so focused in on the white iPhone she holds in angled portrait position; she’s found your new iOS app and it’s all she can focus on despite the conversations going on around her. She could easily be browsing your new dating iOS app or reading hotel reviews on your website in this cleverly designed template. Whatever your product has to offer the young hip consumer, display it on this iPhone Placeit template today. It’s fast and easy and your marketing team will thank you. Just drag and drop a screenshot of your app or website directly onto the screen in this iPhone mock-up template or click on the "Grab Screenshot From URL" button above the photo and type in the URL so Placeit can do it for you. Get custom mock-up templates featuring your app or website with this Placeit iPhone template today. How fun is this template? 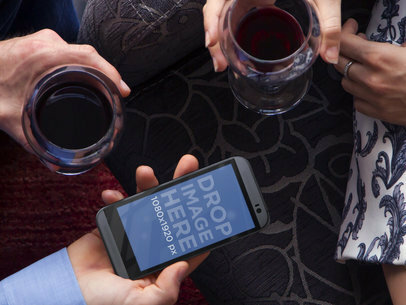 Lets have a drink together and check out your newest android app featured on this black HTC One M8. Everyone loves a night out and sharing the latest websites and apps. Showcase your web products anytime and anywhere on the coolest mobile devices with Placeit mockup generator. Capture this modern day couple, on a typical weekend and put your android app in their hands. They couldn’t be happier they found you. This template is all about fun, sharing and modern mobile technology, use it right away to enhance your app marketing strategy. See more Android mockups here! This HTC mockup is a fun one. We see a young couple on a date, enjoying some drinks, while viewing his HTC phone. They could be looking up movie times, watching a video or maybe he's showing a new app. The screen is facing straight up, meaning you can easily add and great screenshot from your own app. Then suddenly , it's your app this young couple is enjoying over drinks. Making this mockup the perfect marketing tool for you.